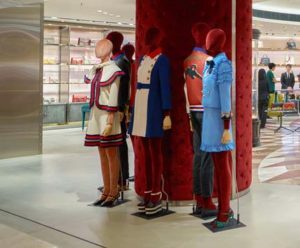 Italian luxury brand Gucci filed a lawsuit against American fashion chain Forever 21 over an alleged copyright issue concerning Gucci’s trademark stripes. This is not the first time the American fashion retailer has tangled legally with the Gucci brand. This latest battle includes Gucci filing a motion to dismiss Forever 21’s earlier lawsuit completely. In a copy of Gucci’s filing for trademark infringement, trademark dilution, and unfair competition, it was stated that Gucci America raised these counterclaims as Forever 21 “challenged its most valuable and widely known marks” – the “blue-red-blue” and “green-red-green” stripe webbing used on much of their sportswear. The high-end fashion brand has used this distinctive banding for over 50 years. This back-and-forth between the two brands has been centered on Forever 21’s use of a certain stripe pattern and specific colors that supposedly belong to Gucci’s trademark. These designs appear on items in question which are no longer on the Forever 21 shopping site, including an embroidered sweater, choker, floral bomber jacket, and faux leather bomber jacket. Los Angeles-based Forever 21 is no stranger to trademark and copyright lawsuits, having previously encountered issues with other famous and high-end brands like Puma (specifically Rihanna’s designs under her brand Fenty), Adidas, Levi Strauss & Co., Anna Sui, and Anthropologie, as well as independent designers like LA women’s clothing brand Valfré, Richmond family-run company Granted Clothing, and Brooklyn eco brand Feral Childe. The latest complaint by Gucci was filed months after they sent a number of cease-and-desist letters in December 2016, worrying Forever 21’s strangely similar designs would be mistaken by consumers as one of Gucci’s. Susan Scafidi, founder and director of the Fashion Law Institute at Fordham Law School, elaborated that Gucci’s famous stripes are not only registered trademarks, but that they have been registered long enough that they have gained “incontestable status.” Gucci first used their striped webbings in the U.S. in 1963, subsequently registering trademarks for the “blue-red-blue” design in 1979 and “green-red-green” in 1988. On one hand, if Forever 21 wins this case, other high-end brands may need to evaluate their use of trademark protection. On the other hand, Gucci has a high chance of winning but needs to prove trademark infringement. This means they need to demonstrate – to a significant degree – how consumers, looking at Forever 21’s alleged knockoffs, would be deceived that they are actually by Gucci. A solid example would be if they could prove consumers mistakenly think these products were a collaboration between Gucci and Forever 21.